Rock your Ride with a Pontiac Grand Prix Subwoofer Box from SuperCrewSound! Make your friends jealous with the superior sound quality you get from your new hyped stereo. The sound quality improvement achieved by adding a Subwoofer Enclosure is unmatched by any other stereo component - not only do you hear it – you “feel” it – and it feels GOOD! This Subwoofer Enclosure is custom made for "your" ride, installs in minutes and is engineered to install easily through your existing trunk opening - no metal cutting required to plant this bad boy. We only use high quality MDF and precision manufacturing in all of our Subwoofer enclosures. 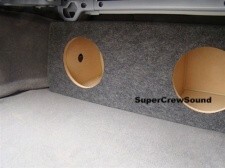 Buy your Pontiac Grand Prix Subwoofer Enclosure from SuperCrewSound - Guaranteed to fit or your money back!